Brroch taught everyone about what he had learned from the Varia Suit. By his teachings the Chozo united to meet the challenge of exploring space. The name Samshus was taken by the Chozo from Brroch’s teachings. It was spoken in reverence with regards to the name of the Sunborn Child that had come and saved them from the Tourians. It was modified into the Chozo language as the second form for the word of hunt. The first form spoke of killing dumb beasts for sport and food. Samshus means the rightful hunting of sentient beings. Another word derived from it was samasa, the Chozo word for the deepest revenge. 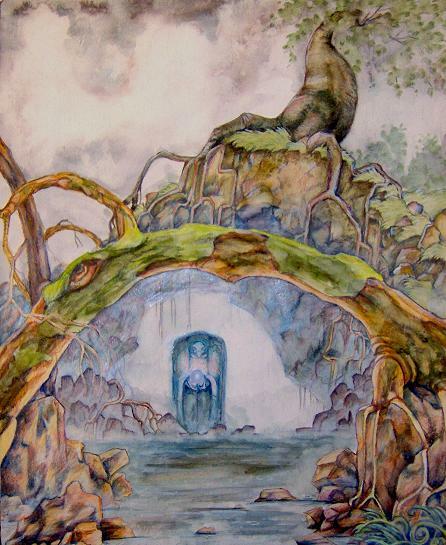 Newborn gave up her struggle as Plogos flew her to the ancient Shrine of Prophesy. Her photographic memory brought up a time long ago when she was taken there in Kerrfu’s arms. She remembered standing before the Empress and Kerrfu as they debated her destiny. Now she was placed again upon the amber stones. Chozo prophesies were written around marking the return of the Sunborn Child, and to warn of the impending doom surrounding the end of the Chozo people. Plogos pushed her through the hallowed corridors. She caught glimpses of the prophesies as she passed: beware the age of freedom, horrible things are coming for those who forget their nature, keep claws planted firmly upon what is seen yet believe and strive for what isn’t. The hulking frame of Kraagon clawed his talons at the end of that very telling line of wisdom. Plogos stared at it for a brief time before moving on. Newborn caught the last line: Only what can be seen with the eyes can be confirmed as truth. The Varia Hallway had a different set of prophesies that spoke of the Sunborn Child. A primitive etching depicted her, golden skin and eyes, long white hair shimmering with brilliance. Newborn read of her origin… a whole planet massacred by the Tourians. All women but the little girl named Samshus had been found and killed. Then the Tourian Mother had the remaining men fight amongst themselves. For her delight did they fight, each one longing to prove their worth. The Demon Mother took the best fighters and left the weaker ones to die out. As the madness of her mental disease passed from the forsaken aliens, they awoke to a desolate land. They vowed their revenge against the Tourian Demons that destroyed their homeworld. Plogos pushed Newborn past the story in the hallway. They entered into a large cathedral. There before her stood a tall Chozo statue. She did not see the exquisitely carved work of art however. Her eyes were glued to what its stony talons held. There a purple orb rested, alive with potential energy. She did not hear the many voices of the Chozo birds who were worshiping there. The glowing orb held her in a telepathic, mesmerizing embrace. She knew this orb had great power, probably enough to force her mind open on its own. It could have done the same thing Mother Brian had done. But this thing, this object of great worship asked for her to open to it in such a gentle manner. She eagerly obliged its request. Tendrils of itself softly moved within her mind searching her memories. She let it see her upbringing among the Chozo, how she had learned to hunt and act as the birds did. She let it see her deep friendship with Kerrfu, how the old bird treated her like a daughter. It was not allowed to see anything before that. Curiously it probed to see beneath those common memories, politely she declined. “Why won’t you show me your true parents?” It asked. It unfolded itself, liquid mater, snaking wires, and gleaming power, opening its mind to her. She saw its first waking memory several thousand years ago: a little girl staring at it in horrified wonder. The girl looked very similar to Newborn, yet somehow extremely different. The long golden hair was there but the blue eyes were replaced with yellow ones. The skin was yellow instead of tan and she had no protruding nose, only two tiny breath holes. Newborn realized she was not looking at a human being. With that Newborn nodded her head. A dam of flooding images broke forth. They flowed in torrents of anguish… flames and carnage, cityscapes destroyed… streets strewn about with dead humans… the pirates of space had killed everyone on plant K2-L, everyone but her. Millions of lives massacred, a genocide of grotesque proportions. She saw it all then: Plogos and Kraagon were fighting against three hooded Chozo as the remaining worshipers scattered. The Empress was helping them through the cathedral, away from the Varia Suit, away from her only instrument of revenge. 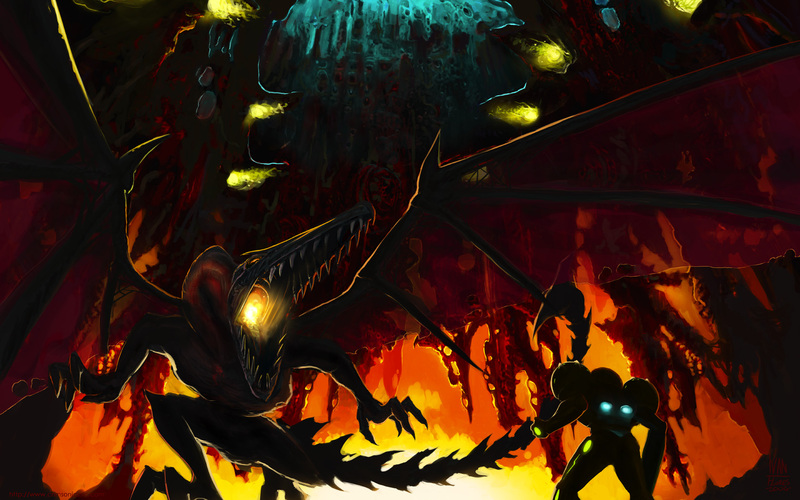 Samus screamed for them to let her go. In both Human and Chozo she begged them to return, begged them to let her merge with the power suit. Even when she was placed in Kerrfu’s gentle arms she couldn’t stop herself from screaming. Kerrfu flew her away singing soft lullabies to quiet her. Nothing could quiet the madness. In the midst of Newborn’s screams the haunting memory of the dragon returned. The dragon-like alien easily chopped her father’s head from its body. With a smirk he threw the head at Sarah’s mother. The head hit her mom at such a velocity the neck broke. Sarah Drillsmith saw her father’s head held in her mother’s limp embrace. The gigantic alien stepped near where Sarah was hidden away. Some of her parent’s blood splashed upon its dark filthy scales. She glanced at those scales and saw her reflection looking back at her from a thousand angles. She saw the little girl named Sarah Drillsmith. She saw the young girl christened by the Chozo to be their Newborn One. She saw the young woman called by the Varia Suit to be Samus, to wreck havoc upon the space pirates that murdered her family and home. Her madness resolved itself towards a singular goal. 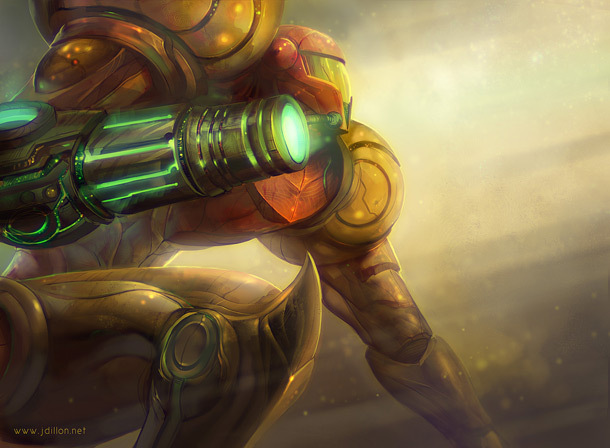 Samus would return again and merge with the Varia Suit. Then she would have her deepest revenge. She would start by slaying the dragon.